A guided tour of radical Stoke Newington history. Is it Feminist? is it just about equal rights? Special fundraising edition of the ‘Feminist (Or Is It?) 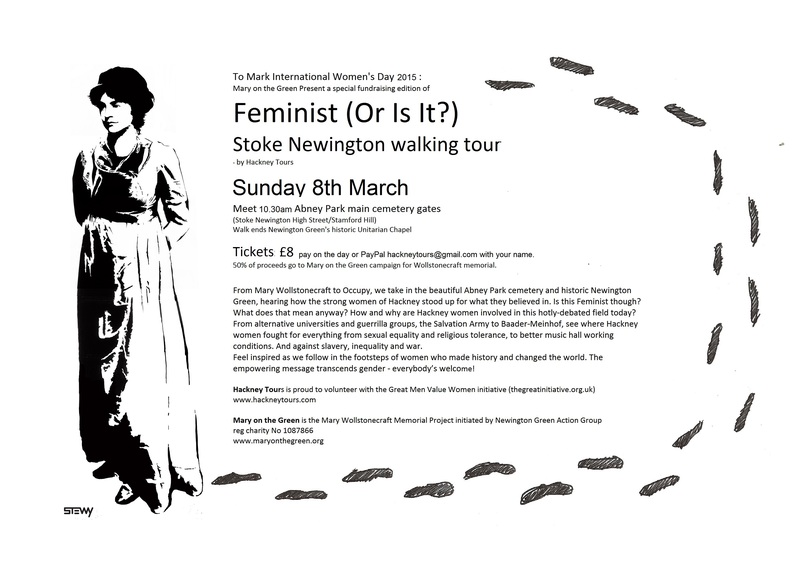 Stoke Newington‘ guided walk (see here for usual walk): Sun 8th March; meet 10.30am main gates of Abney Park cemetery N16; cost £8 with 50% of proceeds to fund for Mary Wollstonecraft statue in Newington Green (see here); just turn up. Features the stunning Abney Park cemetery (Hackney Tours video here) and the campaign for more recognition for Mary Wollstonecraft. Come and get involved! Read about how Hackney Tours is involved in the contemporary campaign for equal rights and how it liberates both men and women here.